Amenhotep I (Amenhotep, sometimes read as Amenophis I and meaning "Amun is satisfied") was the second Pharaoh of the 18th dynasty of Egypt. His reign is generally dated from 1526 to 1506 BC. He was born to Ahmose I and Ahmose-Nefertari, but had at least two elder brothers, Ahmose-ankh and Ahmose Sapair, and was not expected to inherit the throne. However, sometime in the eight years between Ahmose I's 17th regnal year and his death, his heir apparent died and Amenhotep became crown prince. He then acceded to the throne and ruled for about 21 years. Although his reign is poorly documented, it is possible to piece together a basic history from available evidence. He inherited the kingdom formed by his father's military conquests and maintained dominance over Nubia and the Nile Delta but probably did not attempt to keep power in Syrio-Palestine. He continued to rebuild temples in Upper Egypt and revolutionized mortuary complex design by separating his tomb from his mortuary temple, setting a trend which would persist throughout the New Kingdom. After his death, he was deified into the patron god of Deir el-Medina. Amenhotep I was the son of Ahmose I and Ahmose-Nefertari. His elder brothers, the crown prince Ahmose Sapair and Ahmose-ankh, died before him, thus clearing the way for his ascension to the throne. Amenhotep probably came to power while he was still young himself, and his mother, Ahmose-Nefertari, appears to have been regent for him for at least a short time. This is evidenced because both he and his mother are credited with opening a worker village at the site of Deir el-Medina. 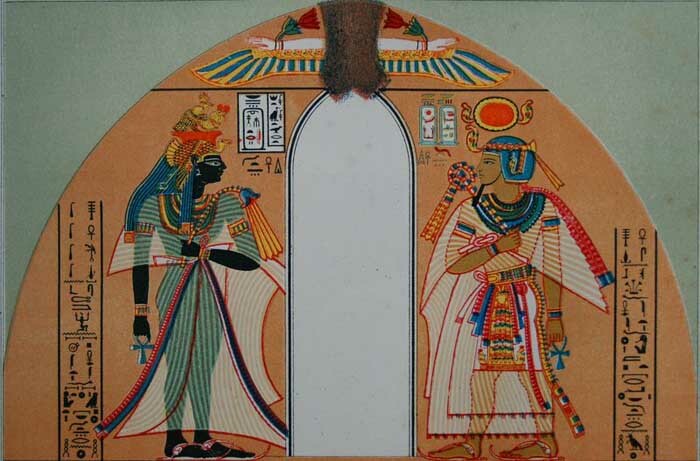 Amenhotep took his sister Ahmose-Meritamon as his Great Royal Wife. Another wife's name, Sitkamose, is attested on a nineteenth dynasty stele. Beyond this, his relation to all other possible family members has been questioned. Ahhotep II is usually called his wife and sister, despite an alternate theory that she was his grandmother. He is thought to have had one son by Ahhotep II, Amenemhat, who died while still very young. This remains the consensus, although there are arguments against that relationship as well. With no living heirs, Amenhotep was succeeded by Thutmose I, whom he married to his sister, Aahmes, although once again there is no definite proof that the two were related. Since Aahmes is never called "King's Daughter" in any inscription, some scholars doubt this relation as well. In the ninth year of Amenhotep I, a heliacal rise of Sothis was observed on the ninth day of the third month of summer. Modern astronomers have calculated that, if the observation was made from Memphis or Heliopolis, such an observation could only have been made on that day in 1537 BC. If the observation was made in Thebes, however, it could only have taken place in 1517. The latter choice is usually accepted as correct since Thebes was the capital of early 18th dynasty Egypt; hence, Amenhotep I is given an accession date in 1526 BC, although the possibility of 1546 BC is not entirely dismissed. Manetho's Epitome states that Amenhotep I ruled Egypt for twenty years and seven months or twenty-one years, depending on the source. While Amenhotep I's highest attested official date is only his Year 10, Manetho's data is confirmed by information from a passage in the tomb autobiography of a magician named Amenemhet. This individual explicitly states that he served under Amenhotep I for 21 Years. Thus, in the high chronology, Amenhotep I is given a reign from around 1546 to 1526 BC and, in the low chronology, from around 1526 to 1506 BC or 1525 to 1504 BC, though individual scholars may vary by a few years. Amenhotep I's Horus and Two Ladies names, "Bull who conquers the lands" and "He who inspires great terror," are generally interpreted to mean that Amenhotep I intended upon dominating the surrounding nations. Two tomb texts indicate that he led campaigns into Nubia. According to the tomb texts of Ahmose, son of Ebana, Amenhotep later sought to expand Egypt's border southward into Nubia and he led an invasion force which defeated the Nubian army. The tomb biography of Ahmose Pen-Nekhebet says he also fought in a campaign in Kush, however it is quite possible that it refers to the same campaign as Ahmose, son of Ebana. Amenhotep built a temple at Sai, showing that he had established Egyptian settlements almost as far as the third cataract. A single reference in the tomb of Ahmose Pen-Nekhebet indicates another campaign in Iamu in the land of Kehek. Unfortunately, the location of Kehek is unknown. It was long believed that Kehek was a reference to the Libyan tribe, Qeheq, and thus it was postulated that invaders from Libya took advantage of the death of Ahmose to move into the western Nile Delta. Unfortunately for this theory, the Qeheq people only appeared in later times, and Kehek's identity remains unknown. Nubia is a possibility, since Amenhotep did campaign there, and the western desert and the oases have also been suggested, since these seem to have fallen under Egyptian control once again. Egypt had lost the western desert and the oases during the second intermediate period, and during the revolt against the Hyksos, Kamose thought it necessary to garrison them. It is uncertain when they were fully retaken, but on one stele, the title "Prince-Governor of the oases" was used, which means that Amenhotep's reign forms the terminus ante quem for the return of Egyptian rule. There are no recorded campaigns in Syro-Palestine during Amenhotep I's reign. However, according to the Tombos Stela of his successor, Thutmose I, when Thutmose led a campaign into Asia all the way to the Euphrates, he found no one who fought against him. If Thutmose did not lead a campaign which has not been recorded into Asia before this recorded one, it would mean that the preceding pharaoh would have had to pacify Syria instead, which would indicate a possible Asiatic campaign of Amenhotep I. Two references to the Levant potentially written during his reign might be contemporary witnesses to such a campaign. One of the candidates for Amenhotep's tomb contains a reference to Qedmi, which is somewhere in Canaan or the Transjordan, and Amenemhet's tomb contains a hostile reference to Mitanni. However, neither of these references necessarily refer to campaigning, nor do they even necessarily date to Amenhotep's reign. The location of Amenhotep's tomb is not certain, and Amenemhet lived to serve under multiple kings who are known to have attacked Mitanni. Records from Amenhotep's reign are simply altogether too scant and too vague to reach a conclusion about any Syrian campaign. Large numbers of statues of Amenhotep have been found, but they are mostly from the Ramessid period, made for his posthumous funerary cult. This makes study of the art of his reign difficult. Based upon his few authentic statues, it appears that Amenhotep continued the practice of copying Middle Kingdom styles. Art in the early 18th dynasty was particularly similar to that of the early Middle Kingdom, and the statues produced by Amenhotep I clearly copied those of Mentuhotep II and Senusret I. The two types are so similar that modern Egyptologists have had trouble telling the two apart. It was probably Amenhotep I who opened the artisan's village at Deir el-Medina which was responsible for all the art which filled the tombs in Thebes' necropolis for the following generations of New Kingdom rulers and nobles. The earliest name found there is that of Thutmose I, however Amenhotep was clearly an important figure to the city's workmen since he and his mother were both its patron deities. Two important pieces of literature were developed during this period. First, the Book of What is in the Underworld, an important funerary text used in the New Kingdom, is believed to have come into its final form during Amenhotep's reign, since it first appears in the tomb of Thutmose I. The Ebers papyrus, which is the main source for information on ancient Egyptian medicine, seems to date to this time (the mention of the Heliacal rise of Sothis by which the early New Kingdom chronology is usually calculated was found on the back of this document). It appears that during Amenhotep I's reign the first water clock was invented. Amenhotep's court astronomer Amenemheb took credit for creating this device in his tomb biography, although the oldest surviving mechanism dates to the reign of Amenhotep III. This invention was of great benefit for timekeeping, because the Egyptian hour was not a fixed amount of time, but was measured as 1/12 of the night. When the nights were shorter in the summer, these waterclocks could be adjusted to measure the shorter hours accurately. Amenhotep's building projects have been mostly obliterated by later construction projects, so it is difficult to appraise the scope of his building program. From written sources it is known that he commissioned the architect Ineni to expand the Temple of Karnak. 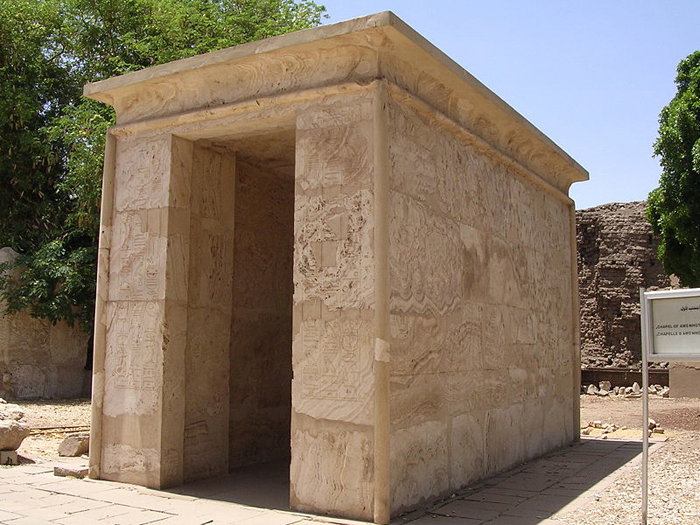 Ineni's tomb biography indicates that he created a 20 cubit gate of limestone on the south side of Karnak. He constructed a sacred barque chapel of Amun out of alabaster and a copy of the White Chapel of Senusret III, however they were disassembled by Amenhotep III to fill his third pylon. Karnak also contains structures which were apparently built for his Sed festival, but he died before he could use them. A temple was constructed in Nubia at Sai, and he built structures in Upper Egypt at Elephantine, Kom Ombo, Abydos, and the Temple of Nekhbet, but did not build anything in Lower Egypt, like his father. Amenhotep I was the first king of Egypt to separate his mortuary temple from his tomb, probably to keep tomb robbers from finding his tomb as easily. The remains of this temple are most probably to be found at the north end of Deir el-Bahri. Deir el-Bahri appears to have had some sort of funerary significance for Amenhotep, since Theban Tomb 358, the tomb of his queen Ahmose-Meritamon, was also found nearby. 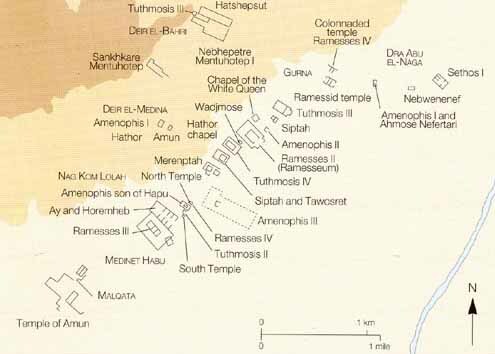 However, Amenhotep's temple was located where Hatshepsut intended to build her mortuary temple. Hatshepsut's first plan may have spared the temple, however when she added the lower terrace it was torn down, and only a few bricks inscribed with Amenhotep's name remain. The royal statues inside of the temple were then moved into the nearby funerary temple of Mentuhotep II. The location of Amenhotep's tomb is as of yet unidentified. The tomb was known to be intact during the reign of Ramses IX, but its location was not disclosed. There are two possible sites for the location of Amenhotep I's undiscovered tomb, one high up in the Valley of the Kings, KV39 and the other at Dra' Abu el-Naga', Tomb ANB. Tomb ANB is considered the more likely possibility, because it contains objects bearing his name and the names of some family members. Excavations at KV 39 have indicated that instead it was used as a previous storage area for the Deir el-Bahri Cache and Dra' Abu el-Naga' ANB is considered the more probable location. Certain scholars have argued that Amenhotep I may have appointed Thutmose I as coregent before his own death. Thutmose I's name appears next to Amenhotep's name on a barque which was used as fill for the third pylon at Karnak,[ and this is often used as evidence that Amenhotep had appointed Thutmose as coregent. This, however, has failed to convince most scholars who note that it may be a simple case of Thutmose associating himself with his royal predecessor. Alternatively, one text has been interpreted to mean that Amenhotep may have appointed his infant son as coregent, who then preceded him in death. However, the scholarly consensus is that there is too little evidence for either coregency. After Amenhotep died, wherever his tomb was located, his body did not remain there. Amenhotep I's body was found in the Deir el-Bahri Cache above the Mortuary Temple of Hatshepsut and is now in the Egyptian Museum in Cairo. His mummy had apparently not been looted by the 21st dynasty, and the priests who moved the mummy took care to keep the Cartonnage intact. Because of that exquisite face mask, Amenhotep's is the only royal mummy which has not been unwrapped and examined by modern Egyptologists. Amenhotep was deified upon his death and made the patron deity of the village which he opened at Deir el-Medina. His mother, who lived at least one year longer than he did, was also deified upon her death and became part of his litany. 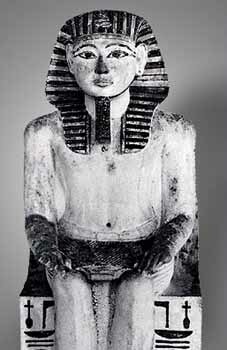 The vast majority of Amenhotep's statuary comes in the form of a funerary idol from this cult during later periods. When being worshiped, he had three deific manifestations: "Amenhotep of the Town," "Amenhotep Beloved of Amun," and "Amenhotep of the Forecourt," and was known as a god who produced oracles. During the first month, a festival was celebrated in honor of the appearance of Amenhotep to the necropolis workmen, which probably means his idol was taken to Deir el-Medina. Another feast was held on the thirtieth of the fourth month, and then two more were held in the seventh month. The first was the "spreading of the funeral couch for king Amenhotep," which probably commemorated the day of his death. The second, celebrated for four days at the very end of the month, was the "great festival of king Amenhotep lord of the town." Later in Egyptian history, the seventh month was named after this festival, "Phamenoth." Another festival was held on the 27th of the ninth month, and the last known festival was held for several days between at least the eleventh and thirteenth days of the eleventh month, which in all probability commemorated the date of Amenhotep's accession to the throne. Further light is shed upon Amenhotep's funerary cult by multiple documents which appear to detail the rituals dedicated to Amenhotep. Three papyri from the time of Ramesses II record the liturgy used by the priests, and reliefs at Karnak and Medinet Habu illustrate select rites and spells. The bulk of the rituals concern preparing for and conducting the daily offerings of libations for the idol, including a recitation of a htp-di-nsw formula, and purifying and sealing the shrine at the end of the day. The remainder of the rites concern how to conduct various feasts throughout the year. In these cases, Amenhotep's idol or a priest representing him is actually officiating the worship of Amun instead of being worshipped himself, which was not a typical cultic practice in ancient Egypt.